In most homes, the dining room is either a place where families come together to share meals or it's set aside for dinner parties and entertaining. Given that it's not used as frequently as other rooms in the house, it runs the risk of becoming neglected and perhaps not serving its role as fully as it should. An unused room? You can't afford it! To avoid this problem, your dining room needs to be continually updated. Your decorating should be fresh and relevant. Some of the easiest ways of achieving this are to change its color scheme, refresh the furniture, and add new accessories. Let's look at some of the quick and economical fixes that almost anyone can carry out without a big budget. Buy the Right Rug. Choose a rug that will provide an elegant and/or dramatic finishing touch, while also adding warmth and texture. Rugs break up the monotonous tone of the floor. Remember, it's important to consider the color and pattern with the overall décor of the room, and most designers will begin with a rug selection before coordinating other furniture purchases and selecting colors, fabrics, window treatments, and wallpaper. Buy a New Dining Table. The type table you buy will depend on the size of the room, the number of people to be accommodated, and your family's personal preferences. Dining tables are available in a wide range of styles, finishes, colors, and shapes - from the more common rectangulars to rounds, ovals, or squares. There are also extending dining tables, perfect for optimizing the space, as they're only fully extended when entertaining a large number of guests. Many families like to purchase a table that will also serve multiple functions: homework and study, computers and gaming, and even home office - spread out your receipts and do your tax returns, handle all your bill paying and correspondence, and so on. If you're not always "dining" in this room, find other useful purposes for the room and find the table that best fits your needs. Paint the Walls. It's relatively easy to change the ambiance of any space by painting the walls. For example, a light shade of grey or perhaps light pink will instantly freshen up and brighten the room. You can add color by choosing imaginative seating, as with Peter Traag's Mummy chair. What About Chair Cushions? First, let's talk about the dining room chairs themselves. Do you want a dining room set with matching chairs? Try selecting mismatched seating, a quite popular option, or purchasing a set of chairs that coordinate well with the table, but don't look too "matchy-matchy." Seating can also be chosen to add pops of color to your room (see photo above). But for plainer seating, add cushions to bring them to life in a simple and inexpensive manner. Take care to coordinate the colors and patterns with the overall scheme of the room in order to achieve a coordinated effect. If your dining room chairs are more comfortable to sit in, they'll also serve those multi-use functions mentioned earlier. You Must Accessorize. Accessories are a great way of expressing your personality, style, and taste. Consider purchasing handmade pieces, for example, vases and centerpieces, antique items such as chinaware and mirrors, or artwork to hang on the walls. 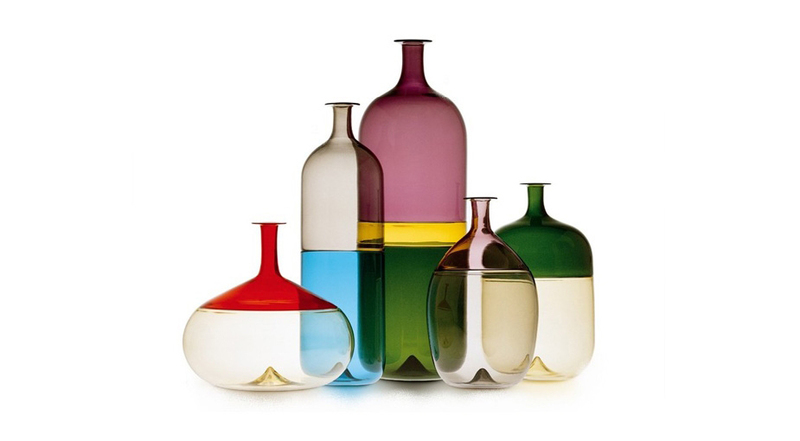 An assortment of Tapio Wirkkala's Bolle Bottles would be striking as a contemporary centerpiece. Lighting Is Important. Depending on the overall style of the space, a contemporary or traditional chandelier can become the focal point of the entire room. Select a fixture that provides adequate lighting; look into newer LED options. Make sure that you add a dimmer switch to your wall switches so you can easily set the mood. An amazing pendant or chandelier can be an incredible focal point for the room. Select one that makes people comment! Consider Wallpaper. Explore using wallpaper, perhaps on a feature wall. It's an easy and inexpensive way of dramatically changing a dining room's appearance, There are literally thousands of patterns, colors, and textures to choose from. For example, select a floral design to accentuate existing chair cushions or table linens. If your space has a wall of built-in shelves, you can also paper the backs of the shelving unit for a dramatic and stylish effect. Mix Up the Furniture. Make the room more interesting by using mismatched furniture. One option is to select the dining table and then look for different chairs that suit its height, color, and overall style. The trick is to ensure they do not match perfectly. But you can also be even more creative with the seating around your dining room table. Take out traditional dining room chairs on one end and add a bench or comfy sofa. At the ends of the table, add chairs with arms to create a dressier and more sophisticated look (and the other dining chairs are without arms). Your chair selection can be eclectic, yet well coordinated so that chair legs and splats tie in with one another. This styling will give the room a comfortable, lived-in mood, which will make any guest right feel at home.